… young people exploring the Bible together and having fun! Twice a month, “Explorers” takes place in the Coffee Lounge at St Mark’s Church during the main Sunday morning 9.30am Holy Communion service (on the 2nd and 4th Sundays of the month only). 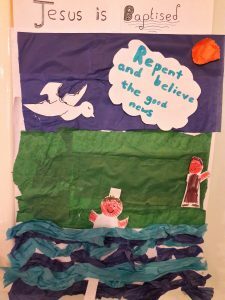 We use a mixture of activities to help our youngsters explore their faith and show Jesus’ love to others in their lives: playing games, reading the Bible and learning verses, using crafts to explore the day’s theme, praying together … and more! Note for parents/carers: All our youth work volunteers are DBS-checked and undergo regular Safeguarding training. Ever wondered what the youngsters get up to in “Explorers”? 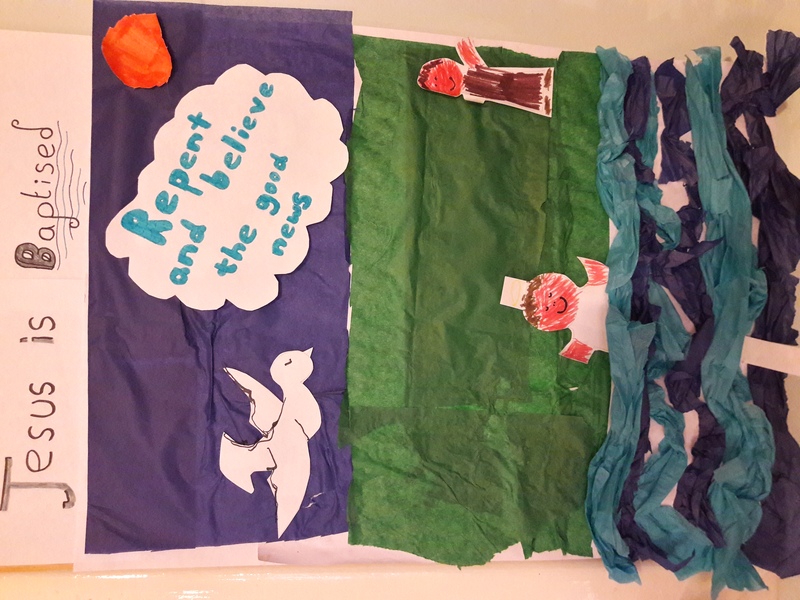 Circle Time: we dunked biscuits in hot chocolate, talked about what John the Baptist did, thought about the meanings of “sin” and “repent”, and read the account of Jesus’ baptism. Everyone joined in, making a separate piece of the collage to illustrate what we had heard. … which was then put together into the complete 3-D moving-part collage! A fabulous piece of work, proudly displayed.